According to a Daily Racing Form report, the Breeders’ Cup’s board of directors will again on Thursday discuss running its event between dates in November and December. One proposal on the table, per DRF, would move the Classic and juvenile dirt races to December, a month after the first 11 Breeders’ Cup races are run. Potential benefits? The premier race would not clash with a college football Saturday, and the option would exist to create a prep for the Classic restricted to 3-year-olds. Potential drawbacks? Pushing back the Classic — the weekend’s biggest draw — could draw attention from the November races. DRF’s Matt Hegarty wrote that the proposal is supported by “several prominent directors,” others are against it, but do not want to publicly oppose celebrity chef, noted horse owner and Breeders’ Cup ambassador Bobby Flay, who is among those pushing for the changes. 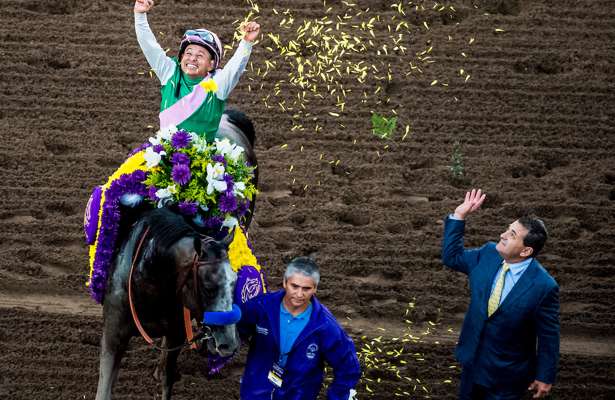 At a January meeting, the Breeders’ Cup tabled discussions regarding a Classic move but did approve adding a new race, a $1 million Juvenile Turf Sprint, as well as upped the Breeders’ Cup Sprint’s purse to $2 million from $1.5 million starting with 2018’s championships at Churchill Downs.